PRESIDENT’S MESSAGE How are you energizing our programs? I am putting a challenge out to all of our units. 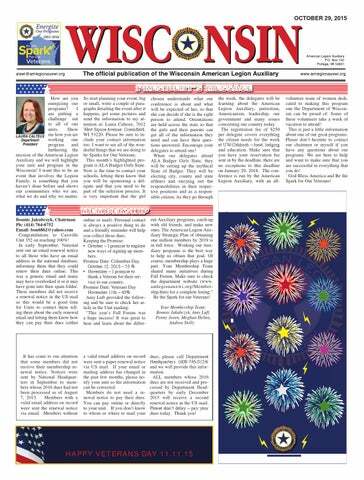 Show me how you are LAURA CALTEUX working one Department President program and furthering the mission of the American Legion Auxiliary and we will highlight your unit and program in the Wisconsin! I want this to be an event that involves the Legion Family, is something that you haven’t done before and shows our communities who we are, what we do and why we matter. dues, please call Department Headquarters (608-745-0124) and we will provide this information. ALL members whose 2016 dues are not received and processed by Department Headquarters by early December 2015 will receive a second renewal notice in the US mail. Please don’t delay – pay your dues today. Thank you! volunteer team of women dedicated to making this program one the Department of Wisconsin can be proud of. Some of these volunteers take a week of vacation to attend! This is just a little information about one of our great programs. Please don’t hesitate to contact our chairmen or myself if you have any questions about our programs. We are here to help and want to make sure that you are successful in everything that you do! God Bless America and Be the Spark for Our Veterans! God asks us to demonstrate our faith and love by our actions. James 2:14, “My brothers, what good is it to profess faith without practicing it?... 26, Be assured, then, that faith without works is as dead as a body without breath.” I hope all of you had an opportunity to do something special for someone on “Make a Difference Day”, October 24. If you were unable to “Make a Difference” on that day, any day will do. “National Family Volunteer Day” is Saturday, November 21. Why not make that an “American Legion Family Volunteer Day”? We serve for More In God’s name we serve Veterans, their families and their communities. We serve by building membership – more caring volunteers. We serve by working the programs – more ways to make a difference. We serve by sharing our talents – more lives touched by generous hearts. Through service comes peace and happiness. God bless us as we work to serve with goodwill, for in God’s name we serve Veterans, their families and their communities. Amen This is an Irish folk song by Susan G. Wente that seems to promote the need for love and faith to be shown in actions. Make us True servants, Text, 1987, World Library Publications Make us true servants for all those in need, Filled with compassion in thought, word and deed; Loving our neighbor, whatever the cost, Feeding the hungry and finding the lost. Lord, make us prophets to cry out the way, Telling the nations of mercy’s new day. Let us break barriers of hatred and scorn, Speaking of hope to all people forlorn. Making a positive difference in the lives of others is what God asks from each of us. May you find fulfillment in service to others. want to get involved. How do you involve older members who aren’t as active as they used to be? Ask them to make potato salad for the community-wide Memorial Day celebration. Encourage them to write notes to members who are sick or hospitalized or call members who need a gentle reminder to pay their dues. Some women might like to knit or sew lap blankets – put an ad in the local paper and ask for donations of yarn and fabric to keep them well supplied. What about young, working mothers who don’t have time to attend meetings or events? Ask them to donate a dozen cookies to the unit Christmas party or see if they would be willing to work with their kids to place flags on veterans’ gravesites for Memorial Day. When people feel good about a cause, they often join the organization so they can get involved – which is a lot easier than knocking on doors to recruit members! But don’t forget, even if you “just pay your dues,” it helps our veterans. The more members who belong to the American Legion Auxiliary, the louder our voice can be to influence legislation affecting our veterans, the military and their families. So please…pay your dues today if you haven’t already done so. And for those who have, THANK YOU. baking for the Veteran next door or visiting Veterans, you can’t choose a wrong hat. You are making a difference! Attendees at the 2015 Fall Informational Forum received a VA&R song sung to Heigh Ho, Heigh Ho. Have fun at your meetings! We are the spark for our Veterans! Let’s make Wisconsin a 100% reporting state. Remember, this goes for all programs. If you are not working it, simply saying so is reporting. Then, let’s break last year’s high records of 74 new volunteers and 39,918.75 hours! Report Deadline: December 15th. As with Membership…Renew, Recruit, Rejoin! Renew your volunteer commitment to the VA&R program; Recruit others to serve our Veterans and military; Rejoin if you’ve been away from the program. It only takes a spark to light a member’s enthusiasm, which ignites another member to action, and before you know it, an ALA wildfire has spread! Thank you for serving our Veterans! to any school personnel. • Use your social media to spread the word and encourage your members to take part by baking goodies. • Volunteer your time at the schools. • Promote all the American Legion Auxiliary scholarship opportunities that we have to offer. It’s never too early to provide the schools and guidance counselors with applications including instructions for our scholarships for this administrative year. MISSION: In the spirit of Service, Not Self, the mission of the American Legion Auxiliary is to support The American Legion and to honor the sacriﬁce of those who serve by enhancing the lives of our veterans, military, and their families, both at home and abroad. For God and country, we advocate for veterans, educate our citizens, mentor youth, and promote patriotism, good citizenship, peace and security. ‘Junior Wizards’ learned about Auxiliary programs and cast spells to help recruit new members in Wisconsin. Central Division National Vice President Lynda Lancaster of West Virginia attended Fall Forum. She is pictured with American Legion Auxiliary Badger Girls State Chairman Diane Kranig and Executive Director Delores Woolf (left photo). Lynda is also pictured with members of eUnit 352 (left to right): Mariah Pursley, Danyelle Thompson, Bridget Cooke, and Bethany Fredericks – the first unit to reach 100% for the 2016 membership year! FALL FORUM HIGHLIGHTS The last Fall Informational Forum was held in Eau Claire on September 18-19, 2015. For those who were unable to attend, you missed some great learning opportunities and activities. Almost 200 members and more than 30 junior members, also known as Wizards in Training, attended the Forum. SPECIAL THANKS to Linda Coppock, Terry Woolf and Tom Petrie for helping with registration and making this event a successful one! In the future, Regional Fall Conferences will replace the traditional Fall Forum to encourage more members to attend. Conferences will be held in various locations around the state. Details are still being worked out, so watch for information in 2016.
tives at the VA Hospitals. They would be happy to talk with you and explain how you might be able to help at that particular facility. No matter what your schedule might be, we should be able to find a great opportunity for you to volunteer. As I sat in the hospital with my husband, I became aware of how many veterans do not receive visits from anyone except our volunteers. I saw the difference it made to these veterans. I benefited from visiting with many of his “neighbors.” Please check to see what you might be able to do to make a difference in a veteran’s life. You can reap these benefits also! Poppy Order forms must be received at Department Headquarters by December 15, 2015. The Poppy Order Form is available on the department website (under Online Forms) or by calling headquarters at 608-745-0124.